Pudge is so cute sharing the stroller with the twins! Congrats on your first place win/plaque! Best wishes for your upcoming Oct. race. Glad you're feeling up for the longer runs Lisa. 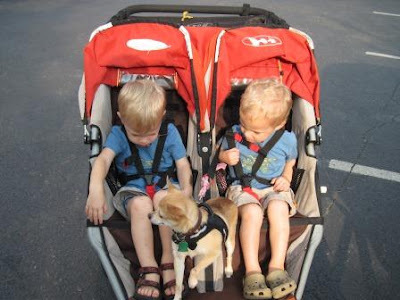 Oh, and the picture of the twins with their chihuahua passenger is priceless! I can't figure out where you find the time to run, blog, cook, clean, laundry etc.. ect.. I have a hard time blogging and keeping up with the housework. That is my goal.... to get my house cleaned from top to bottom. 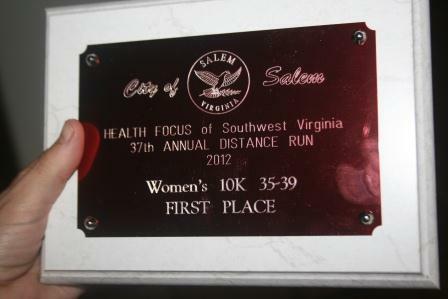 congratulations on your plaque and a good job running. At first I thought you meant that the Chihauha was running the 5 miles and got a very amusing visual on that. Glad to see that he was in the stroller! Good luck with your training! Here you are looking forward to the cooler weather and I dread seeing summer go. You are a rockstar. I can't even do a 5K!! You are my true inspiration!!! What a stroller filled with cuties! I hope to get out and walk each night. Oh how fun to have had a little friend ride along with them. :) Good luck in your training. Those hills are gonna be something! Congrats! That's a nice plaque. Cute photo of the twins with Pudge. Congrats on placing first! You should feel fantastic! It seems your boys are enjoying the puppy dog...sweet! You are doing super with your running! Congrats on your 10K :O). A marathon coming up, you go girl! I agree with the commenter above--you're a rockstar! I am scared of doing a 5K! Love the photo with the twins and the chihuahua--they all look intrigued. I'm looking forward to cooler weather too! you made me laugh. you are a true competitor. you didn't run as fast as you'd like, disappointed in your time, yet you placed 1st in your age group. :) you compete with yourself. congrats on the run! i have a half in november. but i'll be walking it. because it's the wine and dine half. and i plan on doing both during the half. so. Good on you Lisa! I love the doggie and the twins pic! Hope your week is great!!!!! I've taken up running again, even though I hate it. My goal is to get to 10 minute miles, I think it'll be a long time before I do!! I so admire you for running. My daughter is training for her first 5K. Way to rack up your miles! Your end of month posts always inspire me. Love the little dog going along for the ride! I'd have to sit on the stroller, too. Ha! Pudge and the twins! So cute! I'm glad you had a good running month. You are one motivated woman! Love the shot of the twins with the dog. Cute! Hi, Just wanted to drop by and say HELLO. It's been a busy week/month --and just gonna get busier. We still haven't met up! Crazy, busy life gets in the way! I wish we lived closer. I couldn't come close to keeping up with you and I'm nowhere near to 20 miles, but it would be fun to run together. My long runs are up to 9 miles but I'm not setting any records for speed! We ran the mountain road this morning and it was all hills on the way out. The return trip wasn't too bad but I gotta say, I don't love running downhill...I haven't yet learned how to keep it from jarring my body half to death! Love the plaque you received. Way to go! I love the dog in the stroller with the boys. So cute! Now that was ADORABLE and congrats. Congrats!! Good luck on your race in October! The picture of the boys with the chihuahua is too cute. Adorable picture of the boys and the dog. I'm so impressed with all of your running!